The apparent failure of The Idiot is often attributed to Kurosawa’s insistence on following its source material too closely, which results in an uncinematic work or a “book filmed” rather than a “book adapted for film” (see for instance Richie). Not everyone shares this view however, with Coco from us perhaps its most vocal critic. During my latest look at the film, this was very much on my mind. And while watching, I began to wonder whether, far from being a “book filmed”, The Idiot could in fact have been intended as a cinematic experiment. Finding triangles in The Idiot should of course not come as a big surprise, considering that the film which preceded it, Rashomon, was also full of similar compositions as we have previously discussed (see for instance here and here). However, the triangular compositions in The Idiot differ from those in Rashomon because the camera now rarely moves and the resulting scenes are not only flat but also static. This is further emphasised by the overwhelming stillness of the actors, especially when compared with the more kinetic performances in Rashomon. With The Idiot, Kurosawa was predominantly working with still compositions in mind. From my first work Sanshiro Sugata (Judo Saga) to my seventh, you saw comparatively “still” compositions. In my eight, The Drunken Angel, there was the beginning of a dynamic. This accelerated in my tenth work, The Stray Dog, and by my twelfth, Rashomon, I had evolved a counterpoint of stillness against movement. While different from its predecessor in its lack of dynamism, The Idiot nevertheless appears to continue an investigation that Kurosawa began with Rashomon, whose reference point was silent film (see for instance Cardullo, 176). But while Rashomon mainly integrated techniques of the silent film era into a modern film, with The Idiot Kurosawa attempts a fully realised “spoken silent film” — a work which in technique, pacing and form follows silent film conventions, but adds spoken language to the mix with an especially dialogue-heavy story. Visually, this experiment is evident in the above mentioned flattening of the image and the stillness of the camera, both silent film techniques originally born not so much out of artistic preference but because of limitations of available technology — limitations that Kurosawa was no longer facing. But these are not the only aspects of the film which hark back to the silent film era. One of the most easily recognised and also the most criticised is the expressionistic and constantly over-the-top acting, which once again was necessary in silent films due to the poorer quality of film stock and the fact that the more that was conveyed through physical acting, the fewer flow-disrupting intertitles were needed. But as with the visuals, Kurosawa’s choice in The Idiot was no longer a technical necessity, but a fully artistic decision. Further evidence pointing towards formal experimentation with silent films conventions can be found when listening to The Idiot. In its directness and excessiveness, the film’s soundtrack continuously rivals the over-the-top nature of the actors’ performances. It is also almost omnipresent, with some kind of sound or musical theme blanketing almost every scene. And yet curiously, despite its constant and often for a modern film distracting presence, The Idiot‘s score also constantly feels quite out of place, as if it was somehow detached from the visuals, an effect prominent in most screenings of silent films, as they rarely had any specific musical score composed for them. The originally intended structure of The Idiot also appears to emulate some of the major classics of the silent era. With its intended 265 minute running time it would have been considerably longer than contemporary films, but should have been considered quite normal if compared to such silent era classics as for instance Louis Feuillade’s Les Vampires (1915, 440 minutes), D.W. Griffith’s Intolerance (1916, 178 minutes) and The Birth of a Nation (1915, 190 minutes), Fritz Lang’s Dr Mabuse (1922, 270 minutes), Metropolis (1927, 210 minutes) or Die Niebelungen (1924, 269 minutes), Erich von Stroheim’s Greed (1924, 600 minutes cut down to 140 minutes) or Abel Gance’s Napoléon (1927, 235 minutes). This is certainly not to say that all major films of the silent era courted or exceeded the three-hour mark, but there at least appeared to be greater tolerance from both studios and audiences for lengthier titles. 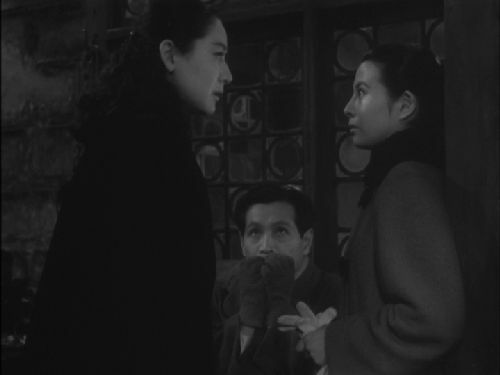 With The Idiot, Kurosawa would bitterly find out that this tolerance did not exist in the early 1950s Japanese studio system (although it must be mentioned that many of the classics mentioned above also ended up with shorter studio ordered cuts). 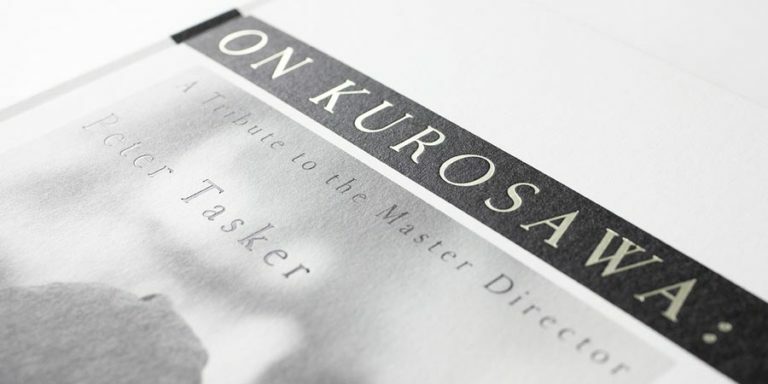 If The Idiot was indeed intended as a formal experiment, a “spoken silent film” as I have argued here, it is clear that the accusation of Kurosawa “simply filming a book” is rather groundless. In this view, the focal point of the work was not so much Dostoevsky but a specific cinematic style that Kurosawa was after. Yet, it seems clear to me that the experiment in The Idiot was unsuccessful. It is obviously very difficult judge and say how much easier it would be to accept Kurosawa’s formal experimentation were we given more time with the film as originally intended by the director, and if especially the beginning of the film was less affected by the cuts, thus giving us more time to enter the world of The Idiot and to get to know the characters, their over-the-top ways and the peculiar formalism of the film that they inhabit. But now, due to the hurried nature of the first quarter of the film, we are very much thrown into the cold water without warning, and it does not feel good. But even if much of the film may have been lost to the cutting room, one must question the original intentions. As mentioned before, many of the film conventions of the silent era were at least originally not so much artistic statements but the best that could be done under serious technical limitations. Even if one may admire the intention and the ambition of the film maker, it is questionable whether the project of a “spoken silent film” could ever have even been successful. 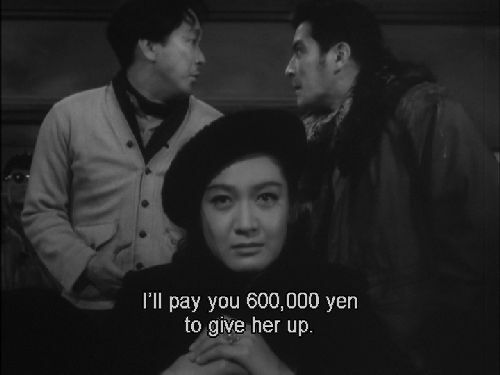 In the end, it seems that Kurosawa himself came to realise this. While many silent film conventions continued to appear in Kurosawa’s film throughout his career, they would be much better integrated with modern film making techniques than they are in The Idiot, which tries to strip away them all. For Kurosawa, The Idiot was a learning experience, and easily his most spectacular failure of ambition among his other similar but far less complete failures. Because of this, The Idiot is an incredibly important work. Much of what was attempted in The Idiot would later be better realised in other, more successful films. Vili, I think this is quite superb and (so far as I’m aware) a genuinely original and unique insight into the film. When watching for the second time, it became pretty obvious to me that I was watching a ‘silent’ film. I’ve been thinking about silent films lately after enjoying The Artist. What I think only a few of the more astute film critics got about that film is that it wasn’t a nostalgia trip for an out of date style of film making, but a tribute, and update, to a distinct art form. Silent films were not talkies without dialogue – there were as distinct from talkies as plays are from opera, or kabuki is from noh. The Artist (the hint is in the title) is a tribute to an almost forgotten and entirely unique early 20th Century art form. One of the most easily recognised and also the most criticised is the expressionistic and constantly over-the-top acting, which once again was necessary in silent films due to the poorer quality of film stock and the fact that the more that was conveyed through physical acting, the fewer flow-disrupting intertitles were needed. This is the one statement would take issue with you – I’m no expert on early cinema, but while there may have been a technical reason for such over-the-top acting and strong music, I think the primary reason for this style being associated with silent cinema is that the early film makers and actors all came from a tradition of highly stylized and formal theatre – vaudeville, pantomime, mime, kabuki, etc. When the talkies came, this led to a more ‘realist’ and also more literary style becoming the norm in film making. But I think many more thoughtful film makers of the time realised that something had been lost, and so there have been various attempts over the decades to reintroduce audiences to what was so wonderful about the silent era, although few of them really worked (a contemporary example to The Idiot would I think be Les Enfants du Paradis). So yes, I do think that Kurosawa was quite deliberately making a ‘silent’ film – in fact, I think that he was trying to do so with Rashomon as well, but in the latter case went for fluid camerawork rather than formalism (with a far better result). I think perhaps, seen from a Japanese perspective, the drama of Russian literature would have seemed a natural source for an expressionistic film. But in this case I think The Idiot is just too dialogue and exposition heavy a story to work in this way, so instead of expressive film making, he ended up with something that looked like Victorian melodrama. In many ways, I think the Idiot can therefore be seen as a dry run, a false start before films like Throne of Blood, Red Beard and Ran, where I think Kurosawa much more succesfully integrated expressive and formal techniques to create great films. Yes, superb. You’ve really enlightened me with this post. Interesting thought about the music. I was very put off by it, infact thought some of it inanely disconnected from what was happening in the film. Now, with this theory, so much of the director’s choices that I couldn’t get a handle on make sense. Thank you! Thank you for the response, guys. To be honest, I’m still quite a bit on the fence whether I would subscribe to this theory of mine. But I do think that it is something that could be explored further, for instance by checking whether specific examples of silent film techniques can actually be pinpointed in the film. 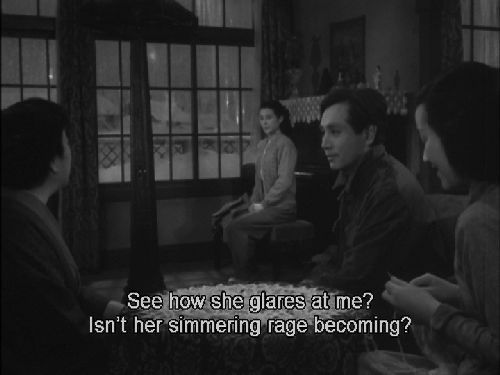 In any case you are absolutely right Ugetsu, stylised formal theatre was a major influence on early silent film. 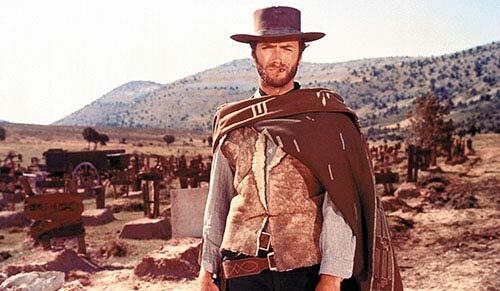 But my understanding is that the primary reason for its influence was that it worked so well in a two-dimensional black and white world, or at least far better than the more subtle types of acting did until film techniques and materials got better. I cannot claim any particular knowledge of silent film, though, so this is just based on what I have seen and read. I have yet to see The Artist, although it is high on my list of films to watch. You just made me want to see it even more, Ugetsu, as now it’s got a Kurosawa connection for me! It is good to hear that I’m not the only one put off by the music, Amnesty. The choices made with the music are really quite baffling, especially considering how skilfully music had been used in earlier Kurosawa films, especially from Drunken Angel onwards. Either there was an experiment like “silent film music” going on, or then the studio-imposed cuts totally messed up everything also for the score. Ugetsu: But in this case I think The Idiot is just too dialogue and exposition heavy a story to work in this way, so instead of expressive film making, he ended up with something that looked like Victorian melodrama. If Kurosawa indeed was making a “spoken silent film”, I wonder if he chose The Idiot precisely because it was the most dialogue-heavy thing that he could think of. It does sound like something that he would do, considering his tendency to go for the extremes. The genre of melodrama is also something that I have been thinking about recently. It has such a central place in Japanese film history, and as a genre term doesn’t seem to have the same type of negative connotation as in the English speaking world. However, my thinking has so far been somewhat hampered by my confusion what the term exactly even means within the Japanese context. This is a wonderful thread-I appreciate Vili for doing a formal analysis of the visual art of Kurosawa’s film, and for those engaging in the conversation, I am so happy to hear your thoughts! 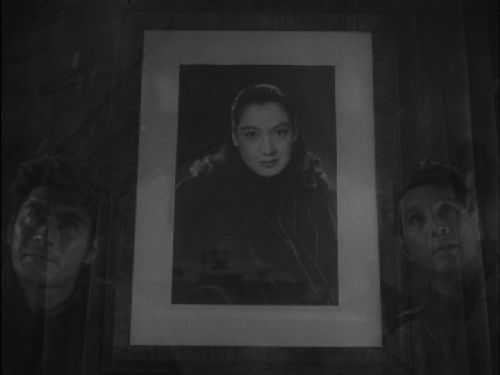 Vili, let’s look at the triangulation of the faces of Hara, Mifune and Mori again, shall we, and then think of “High and Low” ….it is as if Kurosawa is testing this idea of reality as reflection-and uses it differently to problematize rather than illustrate. But, then, is he merely illustrating the “love triangle” that is to unhinge all three? Interestingly, the woman is merely a photograph, a representation and we are to understand that the men are real-though “appearing” as images- they are almost ghost reflections in the glass but are breathing “real” air and are three-dimensional, moving however slightly, investing the flat, static image with meaning. Though the composition is flattened (and Kurosawa flattened almost everything once he discovered the uses of the long telephoto lens-let’s not fool ourselves-the battle scenes in Seven Samurai-particularly the telephoto closeups of horses, mud and men are justly famous and exciting, but FLAT as the lens compresses space) they have invested the image with life, whilst looking through or past their own images. Is it possible this tells us something about the men? Can they be unable to understand themselves “deeply”-that is; in three dimensions, in an environment, as members of society? Their character “flaws” and inability to see themselves as integrated into society (one is too full of violent passions, the other is too “good”-both are unable to bring their full beings into focus) will bring them to ruin. This image is far more interesting and compelling than anyone has yet given it credit for being…and I think of Gombrich’s theory that art has this influence so powerful-that once we accept it as a convention it is terribly hard to break free from. Richie condemned this to being “just a book filmed” (as if that is possible) and we’ve all had that statement color our perceptions-to some degree. Either in agreement or in contrast to the statement…but just look at the use of reflections, and the way it is possible to see a commentary on the men themselves, their relationship to this woman (do either of them have an understanding of her as a real being, or rather are they projecting on to a flat image their own desires?) and to find a fascination in that image that Richie only will attribute to the later High and Low. Is it not a beautiful image, too? Dear friends, if Kurosawa’s brother was a Benshi, and if Kurosawa professes to have loved the cinematic beauty of the silent film, why not take him at his word and look for the love he lavished on this film? 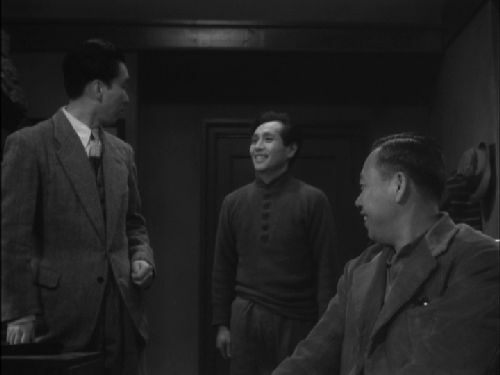 Post script giggle: isn’t it kinda funny how Mori’s face beams up angelically and Mifune’s looks up like a “bad angel”? They look like cartoons of good and evil. And, then, they both meld into the plane of the darkish reflection of the darkish photograph-is this letting us know the fates of these three are one? It just occurs to me that this comic/horrific quality, the stilted and formal nature of the shots, all of these really oddball, unnatural and “off” qualities are the same qualities that I like in Quentin Tarrantino’s work or David Lynch’s work. The scene with Mori at the Buddhist altar, the night chase, the winter carnival scene, the Mori/Mifune blanket scene, the bargaining for Hara’s character (I cannot express how deeply disturbing and real that seemed to me-despite what seems to distress folks as bad acting) -all of these things are quite haunting to me and possess visual power of an unusually potent nature-where perhaps Lynch and Tarantino arrive at similar “weird” places-they don’t necessarily do it such a visually haunting way. Have you all just seen “The Artist“? I watched it on the plane from Barcelona. Terrible hokey film, but dang, the guy looks the part, that’s a cute dog, and there are shots that really are quite lovely-though did anyone else also find the music occasionally quite off-putting and ill-suited? I thought that very strange that i was paying too much attention to the stupid music, when, after all this time, one had all the control in the world over that detail-couldn’t they have done that bit better?! I have noticed myself thinking the same thing when using the soundtrack to Joan of Arc and some of Ozu’s early films. Have you ever thought what it might be like to see a silent film narrate by a benshi? That must be amazing! The film must become a social activity…this “third” dialogue accompanying whatever indicated dialogue may exist in inter-titles and through the pantomime of the screened actors…as I understand it, it was a commentary as well as explication and part of it was acting as well…must have been really something quite wonderful! I’m still thinking about this thread and trying to find time to watch the film again all fascinating stuff. Regarding the Benshi and silent films , recently we’ve finally been able to enjoy a few more films from Japan’s silent era with the Eclipse Ozu and Naruse sets plus the BFI Ozu releases. So I was scratching around on the web for more information on what survives and came across Digital MeMe Talking Silents . Has anyone else seen them ? Although extremely expensive (as any japanese DVD is) I ordered the Mizoguchi ” Water Magician ” which comes with a Benshi sound track so you can watch the silent with the Japanese Benshi commentary and music ( with English sub titles ) . I really enjoyed this experience even though the film survives in quite poor condition . It’s a rare film anyway and quite different with the audio. Of course it can’t be the same as in a theatre but the introduction tried to explain the experience and the same company do some screenings of old silents with live Benshi . Here is their web site which hasn’t been updated recently but I just ordered the other Mizoguchi title so they are still operating. I managed to watch part one again last night whilst trying to think about this thread. Certainly there are plenty of “Triangles” and I agree the reflection scene feels like Kurosawa is somehow displaying and combining the fates of the three disembodied figures right from the start ( or at least the start as the current surviving edit allows) . Regarding the dynamic verses still composition of Rashomon compared with the Idiot , maybe there is a more practical reason? with most of the settings in Rashomon being outside in a forest which allows for more movement, or perhaps requires it, to make a background of branches and leaves more dramatic? and most of the first half of the Idiot being set inside rooms with multiple characters taking part in conversation . From watching as many of the few surviving Japanese silent films that we have access to on DVD as I can, and remembering Japanese studios were reluctant to stop making them after the introduction of sound due to the fame and popularity of the Benshi, it’s clear there were different skills employed by both director and actors that make them really rather wonderful. They didn’t need to think about sound at all as that was all done in the theatre by Benshi and live musicians even dialogue was imitated by the Benshi as part of the narration . 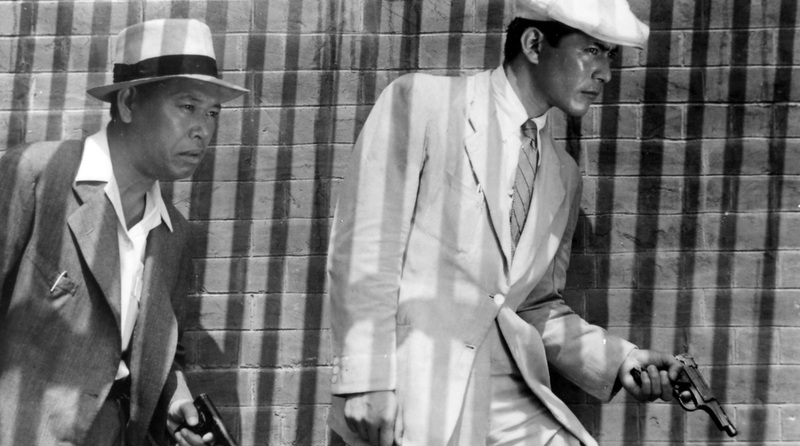 Given the rich history, popularity, and huge amount of silent films made in Japan and the fact that the talkie era was interrupted by the Second World War just a few years after it started it’s no surprise perhaps that Kurosawa might have looked to his favourite silents for inspiration. He didn’t make any silent films where as the other three directors popular in the West ( Ozu , Naruse and Mizoguchi ) all started in the silent era and luckily a few of each of their films survive for comparison. I would have thought it natural for any film director to want to experiment with different techniques just like musicians and painters do. Regarding the score , it certainly is imposing in places I’m sure the re- editing and cutting will have affected this in part one especially . I am just reading ( and enjoying ) Waiting on the Weather where Teruyo Nogami helpfully describes the technique used around the time of Rashomon for adding sound to film and the crazy hurry it was all done in often with composers being asked to score music before they had even seen the section of film . The harsh cutting really couldn’t have helped and maybe they had to insert new music if the original score didn’t fit the cuts. Well , I have to say I did enjoy the first part this time through , many scenes really did seem excellent and with the exception of one or two tiny jarring moments I also warmed to Hara’s performance . 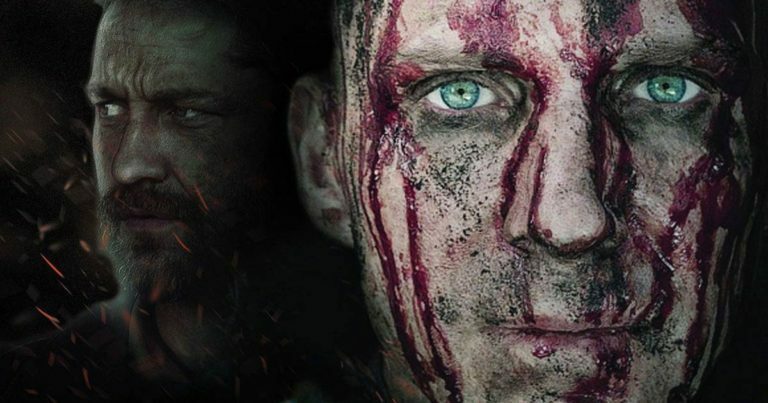 I get the feeling I approached my previous viewing looking for faults because of the general view that this film and some of the acting isn’t supposed to be up to scratch. Longstone, I hope to have time to explore the link you posted regarding “talking silents”. If I can catch even the slightest melody of what it might have been like to hear a Benshi-that would be so wonderful! I just thought that era was past-was live-and was never to be revisited. I never even questioned that there might be a recorded version preserved (or recreated? Do you know if this is newly done or something truly from the past?). ‘The live performance cannot, of course, be truly apprehended in a recording-the live, with all its sense of space and the moment-yet, getting a glimpse of that world would be wonderful! Hi Cocoskyavitch , it seems the best we can hope for is re-created , there seem be some “new” Benshi still operating live to screenings of old films . This company appear to have acquired or been bequeathed a collection of silent films which they have restored to DVD and added a new Benshi soundtrack . They also publish a small book about Benshi which I’ve ordered but am still awaiting it’s arrival. They seem happy to answer email enquiries too. Their pitch is that they are recreating the nearest thing to how the films would have looked and sounded if you had been at a theatre in the silent era. I really like your take on the window image, Coco! And the device is indeed replicated in High and Low, a good call there. And regarding the equivalent scenes in both films, I totally agree with you that the images are more interesting and compelling than what anyone has been able to write about them. But this, I think, is largely because they are both such pure cinematic moments: there is so much information encoded into those shots through purely visual means (well, partly auditory as well) that it feels extremely difficult, perhaps impossible, to put into words what exactly is going on there. For me at least, it seems like I can only scratch the surface if I try to describe them. Yet, I feel so much more when watching them. Longstone, it does sound plausible that the stillness of The Idiot has something to do with the fact that much of it takes place indoors. However, I do think that it is still quite a bit more still than his earlier films with indoor scenes: there is plenty of lovely indoor camera tracking in for instance Scandal, No Regrets for Our Youth and The Quiet Duel. None of that is really present in The Idiot, I think. So I don’t think that it can exclusively have been because of indoor scenes that Kurosawa chose to strive for stillness. I’d love to see a film with a live benshi narration. The benshi system remains a fascinating, although also quite an alien concept to me. The idea that in a “cinematheque” the film would not in fact be the primary, or necessarily even the secondary attraction, but would be subjugated under the performances of the benshi and the live musician(s). I would think that it works better with some films than others. Wouldn’t that be wonderful Coco and Vili? 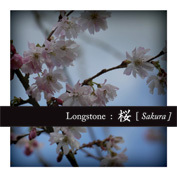 I just checked that sight (thanks Longstone!) and it seems like Digital-meme haven’t performed live since December 2009. Or at least it doesnt list any past performances more recently than that. Oh well…I was thinking maybe a world tour was coming our way! I really didn’t know a thing about Benshi, so thanks all for bringing that art form to our attention. Coco, you bring up a great point about reflections. 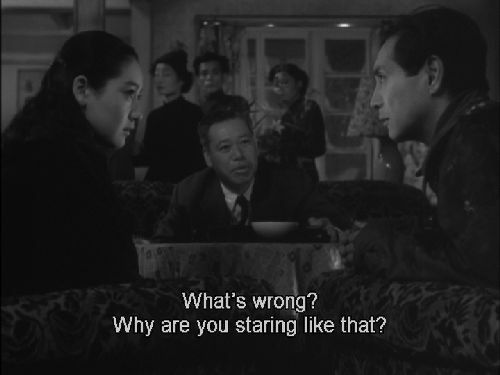 And really, in the end, isn’t Kurosawa asking us to look at ourselves in the mirror of his film? 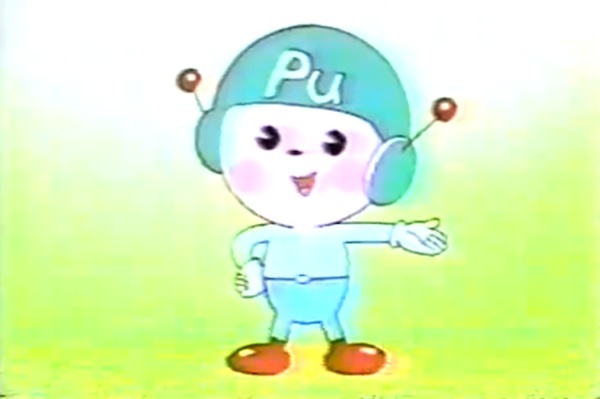 Perhaps originally, postwar Japanese. But it’s universal, ne? We are instructed to see the purely good, the purely abusive and the purely tortured parts of our own souls. This trinity is gorgeously painted in that wonderful moment you speak of. I am waiting with baited breath to see Hara in this month’s film club selection. Will I come to love her as so many do? However first, I realized (since I am so far behind) I must watch Late Spring! So much film, so little time…I’m just in the middle of The Emperor and the Wolf as well, doing my self-study Kurosawa 101 class! Amnesty, I envy you experiencing Late Spring for the first time, and reading The Emperor and the Wolf for the first time!!! Such powerful experiences! I confess I cried…HARD..when reading of Mifune’s last years…do you know, I don’t think I have ever gotten over the Mifune/Kurosawa breakup myself! I wanted the best for both men so so much…! Also, maybe the myth of friendships that are “mutual multipliers” to use a phrase of the Master…maybe I wanted their collaborations to last forever! I remember that I spent one winter holiday holed up in my bed with 5 or six books about Kurosawa, Mifune, and Japanese film around me, reading and checking texts one against another..and just crying aloud inconsolably in the last chapters of Prince’s book. It’s very silly-crying like that- but these two lives have impressed me deeply in ways that continue to have meaning and value. I also can’t seem to get enough of Japanese History, film history and language… as regards to the latter, I will never be able to fully realize my fantasy of speaking and understanding Japanese so fluently that I can watch a Kurosawa film (or anything Mifune is in) in the native language without subtitles. There isn’t enough time in my life to devote myself and in any case, would have to live in Japan to actually come close to being able to do so. So I have the books and films and intermediate Japanese classes to get me by. And of course this forum and my wonderful cohorts here to keep me company! I suspect, it will take me the rest of my life to “catch up” on all fronts, but that is a delicious prospect indeed. Coco: Wait, am I thanking you or finding an excuse for my lack of eloquence…hmmm! 😆 Well, in either case, thanks for the praise, Coco. 🙂 Although I must say that whatever little thoughtfulness and eloquence I may sometimes on a good day have is fully thanks to the inspiration acquired from the source materials that I am commenting on. I’m just listening to the echoes and trying to report what I hear. Amnesty: I suspect, it will take me the rest of my life to “catch up” on all fronts, but that is a delicious prospect indeed. I hope you enjoy the rest of Emperor and the Wolf! Jumping in here to say that the score of The Idiot doesn’t work for me either. It’s too obvious; instead of playing against what’s going on in the movie, as with the Cuckoo Waltz in Drunken Angel, it reinforces what is already overwrought. Mostly it keeps reminding me that this is a Russian story transposed to Hokkaido.